Your dentist in North Austin, Dr. Candace Bruno, believes every patient deserves to have a lifelong healthy smile—even those who have missing teeth. If you are among the 120 million Americans who have lost at least one tooth, she has the solution you need to complete your smile. 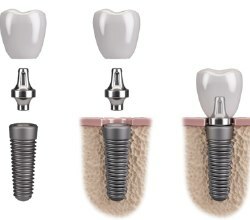 With dental implants, you will gain the next best thing to your natural teeth. When compared to traditional tooth replacement options, like dentures, they work a bit differently. Dental implants in North Austin are the only dental prosthetic to replace both the root and crown of a tooth. As a result, they closely look and feel natural while also offering several advantages that are not possible with other treatments. Their success relies on placing a biocompatible titanium implant post into your jawbone. Titanium is used most often because the body naturally accepts it, and it is durable. By surgically placing the post into your jawbone, it acts as a new root to securely hold your restoration in place. State-of-the-art imaging equipment is used to pinpoint the precise location for placing the post. 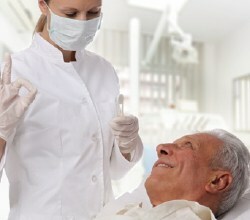 While under sedation or anesthesia, your gum tissue is opened to expose your jawbone. A small hole is drilled into it to allow the post to be inserted. Your tissue is sutured closed, so the healing process can begin. With the post acting as a root, it stimulates your jawbone to encourage new growth. Your bone will fuse to it over the next few weeks through a process called osseointegration . This allows the post to potentially remain in place forever while providing a stable foundation for your replacement tooth. After your jawbone has healed, you will need a second minor surgery to attach an abutment to the post. This is a connector piece between the post and your restoration. 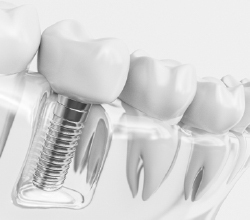 During the procedure, your gum tissue is opened to expose the implant to place the abutment. Your tissue will heal around it to seal out bacteria while also creating a natural-looking gum line. To fill the empty space in your smile, a custom-made restoration is designed using digital impressions of your mouth. It is made to meet your exact color, size, and shape needs to blend in seamlessly with any remaining natural teeth. Depending on how many teeth you are missing, the number of implant posts you need varies, as well as the restoration process. Your cosmetic dentist in North Austin, Dr. Bruno, will determine which solution is best for you. Single Tooth: An implant post, an abutment, and a dental crown are needed. Multiple Teeth: 1 to 2 posts are used to anchor a dental bridge in place. All Missing Teeth: An average of 4 posts are required to secure a custom-made denture. If you are ready to replace your missing teeth with dental implants, Dr. Bruno and her team can help. Contact our office today to schedule your consultation.